Woodland Mills ATV trailers are engineered to be heavy duty and highly versatile off-road trailers that aid acreage owners in maintaining their woodlots and properties. Intended to be towed behind your ATV, UTV or tractor, they will haul dirt, rocks, firewood, logs, wild game and more! Our ATV trailers can be easily converted from dump box trailers to log hauling trailers making them the perfect addition to your equipment line-up. Heavy duty frame construction. Highly versatile rotating crane boom. The T-Rex ATV Trailer was engineered to be a heavy duty, highly versatile trailer for aiding acreage owners in maintaining their woodlots and properties. 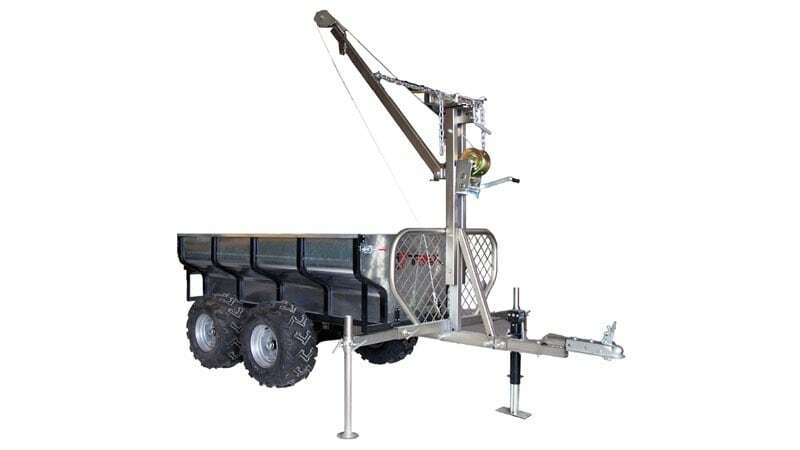 Featuring a rotating crane boom capable of lifting up to 440 lbs (200kgs) objects into the trailer and offering a maximum dumping capacity of 650 lbs (295 kgs), the T-Rex trailer can also easily convert from a dump box style trailer to a logging trailer. The length of the trailer is also adjustable making it possible to safely haul lumber or logs up to 12’ (3.6m) long!